Adds that "the choices we face are stark and the timetable is clear." Theresa May told British lawmakers on Thursday that the October 31 extension agreed with EU leaders the night before was a "compromise" and that the country now faces "stark" choices. The Prime Minister updated Parliament on the result of Wednesday's EU Summit in Brussels during which a six-month extension to Article 50 was agreed. 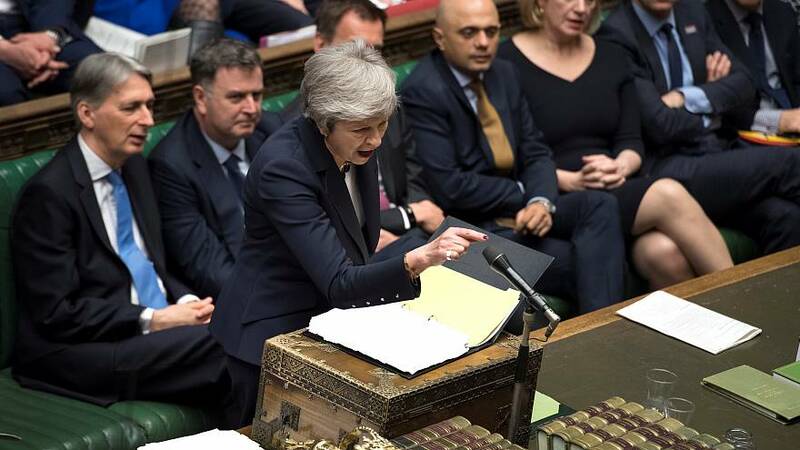 The British leader told MPs that she ensured the country could leave before the deadline should a deal be passed and that she argued that "stringent conditions" should not be attached to the delay. "During the course of the extension, the UK will continue to hold full membership rights," she explained, "including the duty of since cooperation." She added that "the date of departure" and thus the country's participation in the upcoming EU elections "remains a decision for this house" and that "the course of action will be entirely in the UK’s hands." May also reiterated that the EU Council was clear that although changes to the political declaration could be made, "the withdrawal agreement could not be reopened." Read more: Brexit delay: does the extension to October change anything? The prime minister said she welcomed the ongoing talks with the Labour party, warning the opposition, however, that "reaching an agreement will not be easy because to be successful it will require both sides to make compromises." Labour leader Jeremy Corbyn also welcomed the talks which he described as "serious, detailed," as well as the government's willingness "to move in key areas." He still took a shot at May, however, saying that "the second extension in the space of a fortnight" represents a "diplomatic failure." Ian Blackford, the leader of the Scottish National Party (SNP) in Westminster, told Parliament that the government's handling of Brexit had been a "total fiasco" and demanded to know again, whether a second referendum had been discussed during the government's talks with Labour. "With the EU agreeing to a further extension to Article 50, the Prime Minister must use this time to hold a second EU referendum with the option to remain on the ballot," he said. May retorted that the government has not made the offer of a second referendum but that she is certain MPs will "press their case" for one despite the idea being "rejected twice by this House." Other MPs not satisfied with her answer who demanded to know whether she would be willing to organise a referendum on the deal included Vince Cable, leader of the Liberal Democrats, Labour MPs Liz Kendall, Stephen Doughty and Peter Kyle as well as the Independent Group's Anna Soubry and Chuka Umunna. The prime minister was also quizzed about the backstop — the mechanism in the Withdrawal Agreement through which Northern Ireland would remain part of the EU's customs union in the event a better solution could not be found in order to avoid a hard border on the Irish island. May replied that the backstop — which is rejected by large swathes of the own MPs and Northern Ireland's Democratic Unionist Party (DUP) on which her minority government relies for support — "should never be used." "We have consistently sought to change the Withdrawal Agreement" on this issue, she added. It comes as DUP leader Arlene Foster met with the EU's chief Brexit negotiator, Michel Barnier, on Thursday so that "Brussels understands why unionism rejects the Withdrawal Agreement." "A new barrier between Northern Ireland and the rest of the UK is unacceptable," she said on Twitter. Scotland's First Minister, Nicola Sturgeon urged May in a letter on Thursday to ensure the second extension "is used constructively and not wasted." "We now have the gift of more time from the EU, and that must be used constructively to reset the UK Government approach," she went on, calling on May to also include devolved administrations and the other parties to talks currently taking place between the government and the main opposition Labour party. Lawmakers also heard from Attorney General Geoffrey Cox earlier on Thursday. Cox began by assuring members that leaving the EU will not affect human rights policy. Chris Bryant, an MP for the opposition Labour Party, asked what the UK is to do regarding justice if the European Arrest Warrant is no longer available. No mention of the October 31 deadline agreed by EU leaders in the early hours of this morning. Why make taxpayers fork out for EU elections? Mark Francois, perhaps predictably, responded indirectly to the new deadline with the tacit acknowledgement that the UK will have to participate in EU elections next month. He railed against the idea of spending "100 million pounds of British taxpayers money electing 73 members to the European Parliament to serve for a maximum of five months." Cox said it doesn't "to the outside eye look sensible" to hold such election when the entire country is expecting us to leave. But we are under a legal obligation to do so. However, Cox went on: "Let us ratify the Withdrawal Agreement, and we're out!." The SNP's Pete Wishart made a selection of Halloween-based jokes at Theresa May's expense. There is no more appropriate date, he asserted. The House of Commons is to take a break for Easter. Leader of the House, Andrea Leadsom, has published the business scheduled to be discussed in the house the first week the members come back from Easter break. No mention of Brexit whatsoever.